The first drop of Rihanna’s last FENTY x PUMA collection has released! Hit the beach on PUMA.com! Make sure to check out the promo shoot in UHQ, all available in our gallery! Lots of gifs after the jump! Posted by An.J / Filed under: FENTY x PUMA / Leave a comment? The occasion was a “pep rally” for the drop of Rihanna’s Fenty x Puma fall 2018 collection, which showed during Paris Fashion Week last winter at the Bibliothèque nationale de France. 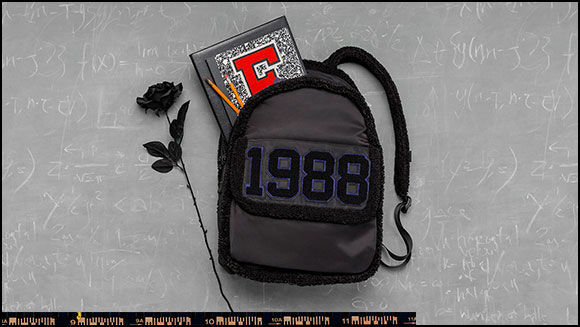 Rather than teacher’s pets, though, Rihanna was inspired by the stylish delinquents of detention who toss textbooks to the wind, showing shoelace chokers, platform sneakers, and plenty of crop tops. We really can’t think of a better reason to skip school (or work) on a Friday than to attend Rihanna’s Fenty University, which is basically the Harvard of fashion. Below, she schools us on everything from style to Instagram. So, you’re teaching a Fenty University master class. What would you want to tell young girls about how to wear clothing that fits their bodies, but also makes them feel good? Well, I actually have had the pleasure of a fluctuating body type, where one day I can literally fit into something that is bodycon, and then the next day — the next week — I need something oversized; I need a little crop here and a high-waist there to hide that part, you know? I love to play with silhouettes as well, but I think it’s important to make sure that you wear the thing that works for your body the best, and that’s flattering. Posted by An.J / Filed under: Fenty Beauty, FENTY x PUMA, Instagram, News / Leave a comment? 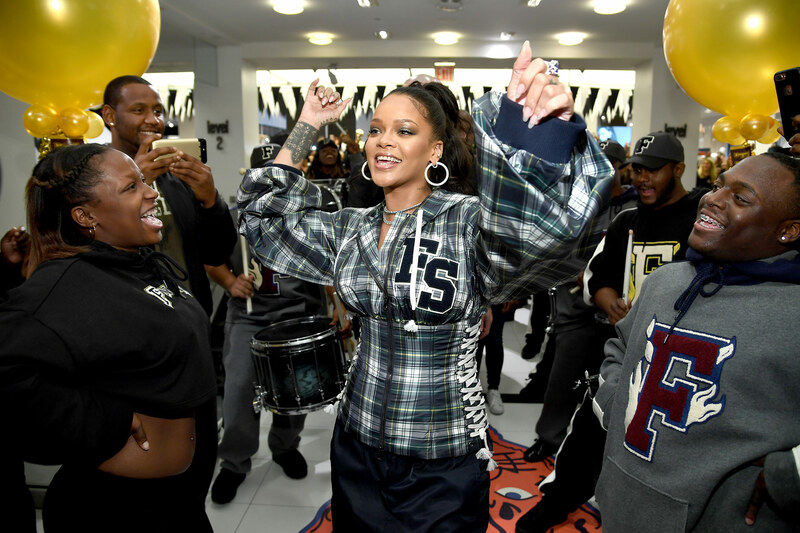 Rihanna hosted a pep rally to celebrate the launch of the AW17 FENTY x PUMA collection at Bloomingdales in NYC today (Oct 13th). Posted by An.J / Filed under: Appearances, Fashion, FENTY x PUMA / Leave a comment? The FENTY x PUMA F.U Suede slides have arrived! Join FENTY University with these comfy slippers in three colorways. A little tip is to order a size down since they run big. Head over to Puma.com and get yourself a pair! Welcome to the Fenty University! Rihanna’s AW 17 FENTY x PUMA collection is ready to take you back to school. Head over to Puma.com to get your Fall pieces! You had to be cautious walking into Rihanna’s Fenty x Puma show at the Park Avenue Armory tonight (Sep 10th). The venue was shrouded in almost complete darkness, save for the glow of overhead lights that shone on the glittering pink mountains of sand in the middle of the space. In fact you could have easily missed the scarily steep ramps that were sitting at each end of the runway altogether. The sound of engines revving backstage, however, was unmistakable. And as the lights went up and the fog machines began to blow, the vrooming got louder and boom! A motorcycle sped out from the curtains, flying through the air with a 360 flip and a perfect land on the other side. Three more motocross stuntmen followed: was this a fashion show or the Big Apple Circus? It was, by and large, the jolt that New York Fashion Week needed after what has been a pretty subdued round of weekend shows. Rihanna’s event was primed to be a highlight, but few could have anticipated tonight’s breath-taking spectacle. After the jumps, spins, tricks, and parade of Fenty x Puma’s motocross-meets surf looks, the Bad Gal took her bow—or ride, we should say. She came in with her hands raised in the air, perched on the back of a motorcycle, blowing kisses to the elated crowd. Posted by An.J / Filed under: Appearances, Fashion, Fashion Week, FENTY x PUMA / Leave a comment?